Many of you took part in our latest CAL, the Technicolour Floral Blanket. This blanket is a rather gorgeous one, consisting of just one floral motif repeated in a series of colour ways, joined together to form a bright and beautiful blanket! It will be sure to brighten up any room in the house. The Knitting Network were very lucky to have crochet designer Sharna, of Sweet Sharna, take part in the CAL. Sharna is a wonderful crochet influence on Instagram, sharing her bright and colourful crochet pieces. You will find a whole range of granny squares and lovely chunky makes! Sharna posted some lovely progress images of the Technicolour Floral Blanket over on her Instagram account. Granny square blankets in bright colours are always a treat. This chunky blanket looks super cosy! Where do you start your creative process? My creative progress can come from anywhere really. I might see some beautiful yarn and think ‘oh wow that will make a lovely hat or scarf’ or I will wake up and think ‘today I want to start making a new jumper’, so I might sketch some ideas down. I can be scrolling through Pinterest and see a beautiful blanket that inspires me to start something new. What is your favourite colour palette to work with? I am always drawn towards pink, mustard, grey and cream shades. Who is your biggest crochet influence or favourite designer? I don’t have any favourite crochet designers, as there are too many to name! Especially on Instagram, where I like to share my work, I am constantly inspired visually by amazing crochet designers. I am very drawn to Boho style crochet, I just love the mix of clashing colours and the use of tassels. How long have you been crocheting for and how did you learn? I studied textiles at college and I love to make my own clothes and create beautiful pictures from recycled materials. However, I was never really interested in crochet until three years ago when I saw a beautiful crochet top in a little boutique shop that made me want to learn. I taught myself by watching YouTube tutorials and after a few dodgy granny squares, I decided to take myself to a beginner’s crochet class. That’s when the addiction started! What is your favourite type of yarn/fibre to work with? My favourite yarn to work with is Peruvian Chunky wool. It feels so special and the texture you get from just simple crochet stitches, such as a triple crochet stitch or half triple stitch is amazing. I love how you can whip up a jumper or cardigan within a few hours. I also like to use cotton yarn for making crochet tops, cushions or blankets. I love the feel of cotton, and crochet stitches look so much neater when using cotton yarn. What is your favourite piece you’ve ever made and why? My favourite crochet make has to be a giant granny square blanket consisting of 80 squares and each square only has two rounds. The blanket was made using Peruvian Chunky yarn in two of my favourite colours- cream and pink. It is great for snuggling under on a freezing cold day. The yarn was very expensive, I could never afford to spend that much on yarn, so it is super, super special and no one is allowed to touch it in my house, except me! If you could give any advice for anyone new to crochet or thinking of trying it out, what would it be? I occasionally teach beginners crochet classes and the advice I always give to my ladies when learning to crochet is to practice every day until it is stuck in your head and to never give up, and to give yourself time. Thanks so much to Sharna for taking part! You can follow Sharna on Instagram and see all her wonderful crochet! 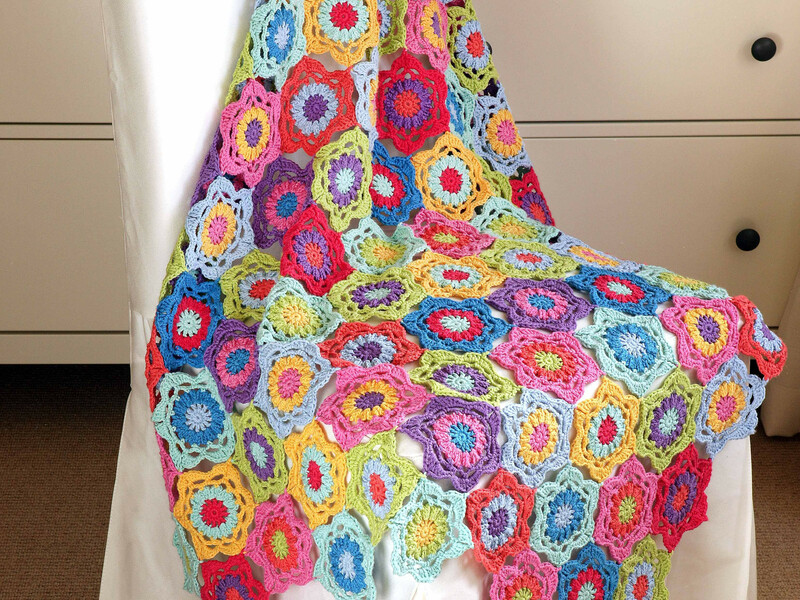 If you would like to have a go at the Technicolour Floral Blanket CAL then it isn't too late! Purchase the exclusive colour pack and download the pattern for free. Join our exclusive crochet a long page for updates on all the latest CALs, as well as crochet support and advice from fellow crocheters! Share your progress pictures, we always love to see how you are getting on.